Highly durable Bausch Watch Towers and tower components are built from marine grade aluminum and composite materials. All of our products are modular in design for logistics and can be assembled on site prior to installation. We specialize in marine fabrication, offering the only modular-constructed lifeguard towers in the United States. Fully-customizable, we can build professional and highly durable lifeguard shelters to meet your community’s unique conditions while incorporating creative, original ideas! Towers come in three standard sizes and a variety of base heights. Additional features include first-floor storage, board racks, and custom chairs. Designed for easier shipping and on-site set-up by our professional fabricators. A wide variety of artistic customizations are available for any tower, including themed designs, color powder-coating, and incorporation of your community or company logo. Built from aluminum and composite materials, Bausch Watch towers are designed for durability practical use in the marine environment. We serve municipalities, private associations and private businesses. Our scope is not limited, however. Some products may be suitable for marinas and residential needs such as ladders, gangways, stairs and railings. Call today and find out what we can build for you. 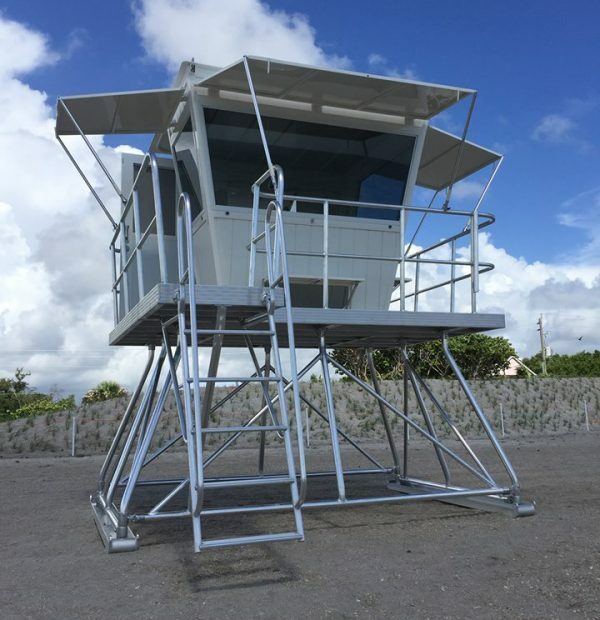 Our lifeguard tower products are modular in design which means they can be broken down for shipping and reassembled on site. This element increases efficiency and product service life. Damaged or worn parts can be replaced or broken down and repaired as opposed to purchasing an entire new tower. Our “flagship” tower, this model is designed for dual occupation or for use as a control tower. The Zero comes standard with an eight foot height from the ground to the platform, and 49 square foot shelter space with room for two chairs and equipment. Deck will accommodate comfortable outdoor seating. Additional skids per customer specification; 10 and 12 inch width options available. Modular aluminum construction is powder-coated white. A protective, ceramic coating is applied to the exterior for excellent durability in the marine environment. 3, 15 degree windows are approximately 36’’ tall to offer 50 square feet of viewing area. Windows are tint in tempered glass and available with folding, lockable shutters. We are delighted to work closely with you to help you develop unique designs to include your logos, artwork, or other creative specifications. A range of colorful and artistic designs is possible in addition to the options above. Our original sketches are also available to help you find a creative, functional, and durable lifeguard tower. Please contact us to schedule an appointment to consult with a specialist. Our deck structure is constructed of marine grade aluminum with embossed composite decking for the walking surface. The shelter is constructed of marine grade tongue and groove aluminum extrusion which provides an air space which will help insulate the structure. The shelter is powder coated with a marine grade off white powder inside and out and then protected with a ceramic coating on the exterior. The tower will sit on a 304 grad stainless steel base structure with low angle diamond plate stainless steel stairs to access the deck at a 5 ft. elevation. Also, towing eyes are built in to the base for moving the tower by dragging down the beach. There is excellent ventilation with a 30” wide door and large hatches on the front, side, and rear walls. The front hatch can also doubles as a place to sit on the front deck. The ¼” spacing between the deck boards allows for an updraft plus prevents water and sand accumulation. The composite decking will not rot or get soft and will not require much maintenance. All railings are constructed of anodized aluminum marine grade schedule 40 pipe which is very corrosion resistant and has a brushed finish. Flag pole holder included. The windows are impact glass with gray tint in the glass. The 3 main windows are high quality 36” tall aluminum framed with a minimal blind spot in the front corners. The 30” aluminum door has an impact glass window; this includes stainless steel handles, a hole for a deadbolt, and optional exterior aluminum panel to cover the window for security. Custom modifications are possible as we are very receptive to incorporating your ideas and making changes to fit your needs. The warranty on the structure and base is 15 years with a 1 year warranty on the powder coating, doors, and windows. We offer other options for the tower including upper and lower shelving, cabinets, and stair gates to name a few. We can provide an options list with pricing upon request. The walls of the shelter slope outward at 10 degrees from the floor up, making the shelter more spacious. The shelter has 16 square feet of floor space. The shelter comes standard with a counter along the front window. Four stainless steel lifting eyes at roof make it easily picked up by a crane. The roof is a one piece gel coated fiberglass panel supported by angle roof beams with the urethane insulation underneath so no roof hatches to leak over time. The roof slopes 3 degrees from front to back to allow water to run off. The three shutters are made using aluminum square tube and skinned over with aluminum sheet then powder coated, they are not heavy but strong. The shutters are supported by anodized aluminum supports to the railing and secured by pins that are easily operated by one person. The shutters are easily secured from the interior using pull pins when the tower is closed down. We use all stainless steel hardware, fasteners, hinges, and latches. We understand the harsh marine environment and source the best hardware available. The price does not include delivery to your location, or the crane or large forklift is required to affix the platform and shelter on top of the base structure at a staging area near the towers final destination. Our newest model built was designed for Stuart Beach in Martin County, Florida. The Stuart Stand is a one person tower featuring a unique design which offers portability, comfort, and durability. The Stuart Stand is fabricated using high quality marine grade aluminum extrusions then is powder coated inside and out, then treated with a clear ceramic protective coating for added protection on the exterior. Features include a large doorway and opposite opening window plus two hatches for excellent ventilation. The caped cellular PVC decking boards are spaced apart for added ventilation and will never rot or require maintenance. The windows are a tough ¼” thick tinted lexan to help reduce glare and keep the tower secure. The base model includes an aluminum base structure supporting a 4’ high platform. Our shelter has a footprint of 47” by 53” at the floor. The ladder and railing are built of anodized aluminum and are standard for the tower. Custom designs, colors, and options are available. We are very open to customizing to fit your needs, just ask. Our shelters are modular to allow for reasonable shipping and easy to assemble on site.